to the right ventricle, which pumps it to the lungs to get oxygen. This blood re-enters the heart through the left atrium and passes to the left ventricle where it is pumped to the rest of the body. So the first circulation (the “right heart”) oxygenates blood, and the second (the “left heart”) circulates it to the rest of the body. We don’t, unlike Time Lords, have two hearts, by the way; the right and left heart thing is simply shorthand for which side of the heart we’re referring to. All clear so far? In the womb, the situation is different; our lungs are essentially redundant as they are filled with amniotic fluid, so blood is oxygenated by the placenta. 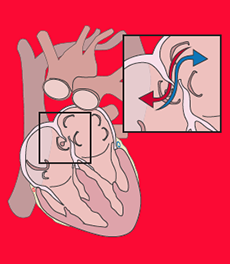 Blood therefore bypasses the right heart (and the lungs) by flowing between the two atria through a PFO, so-called “right to left shunting”. Thus we are all dependent on a PFO before we are born. When the lungs start working at birth, a flap gradually closes this hole so the blood can flow to the lungs to be oxygenated. However, in 25-30% of people, the flap doesn’t fully seal, and can be opened again if the right heart pressure rises above the left. 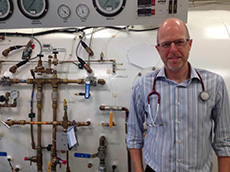 Normally this doesn’t happen: the pressure required to pump blood around the whole body is far greater than that required to get blood to the lungs and back, so the left heart is correspondingly at much higher pressure than the right. However, a surge of venous blood can occasionally cause right heart pressure to exceed left. Typical situations in divers might be soon after an over zealous Valsalva manoeuvre, lifting a tank, or when struggling up a ladder heavily laden with wet kit. Blood then shunts from right to left across the PFO, and if the blood contains nitrogen bubbles, they will be squirted around the body by the left heart, to wreak potential DCS havoc as they lodge in small blood vessels. (eg. migraine sufferers who regularly dive deep and long). The “bubble study” involves injecting tiny bubbles into a vein and following their passage through the heart using an echo probe. If a PFO is present, bubbles can be seen passing through it. Various types of occluder device can be deployed across a PFO via a catheter introduced into a groin vein, and usually after a few months and another bubble study confirming the PFO is sealed, diving can safely resume.